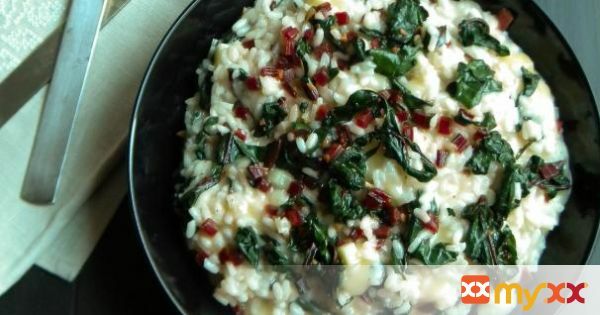 Garlicky sauteed Swiss Chard and Fontina cheese, stirred into creamy Parmesan risotto. 1. In a large saucepan, bring the broth and water to a boil. Cover and set aside. 2. Heat olive oil in a 10-inch skillet over medium heat until oil shimmers, add chard stems and a pinch of salt. Saute, stirring frequently for about 5 minutes. Add chard leaves and cook until wilted down, about 5 minutes more. Add the minced garlic about a minute before the chard is done, stirring constantly until fragrant. Remove from heat, cover and set aside while preparing the risotto. 3. Melt the butter in a large skillet over medium heat. Add the onion and a couple pinches of salt. Cook onion, stirring often, until soft and translucent, about 7-10 minutes. Add the rice, cook, stirring often until the edges of the rice start to become translucent, about 4-5 minutes. Add the wine, cook and stir until completely evaporated. Add half the broth/water mixture, cook stirring often (about every 3 minutes) until completely evaporated. Continue ladling in the liquid about 1/2 cup at a time, stirring until evaporated, and repeating this process, until the rice is tender and creamy. Then add in the Parmesan and lemon juice, stir well. Season to taste with salt & pepper. 5. *This recipe can be easily made gluten-free, if you make sure your broth is a gluten-free brand.